Associate Professor of Political Science Ben Berger (far right) regularly speaks out on public issues on WHYY’s Radio Times, where, last July, he joined host Marty Moss-Coane and Salon.com editor Joan Walsh to discuss a variety of topics, such as Arizona’s new immigration law and the declining popularity of President Obama. 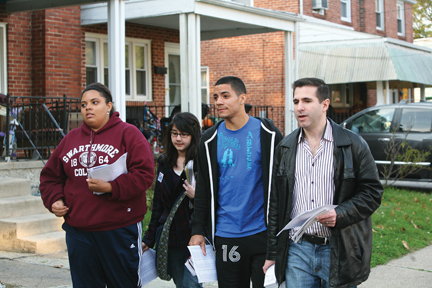 Before the 2009 election, Berger took students canvassing to get out the vote in the City of Chester. Ben Berger, associate professor of political science and an expert in political theory, is representing Swarthmore in the first cohort of 26 faculty members—one each from the Project Pericles member schools—at the Periclean Faculty Leadership Program. This signature program of Project Pericles is designed to champion civic engagement in the classroom, on campus, and in the community. 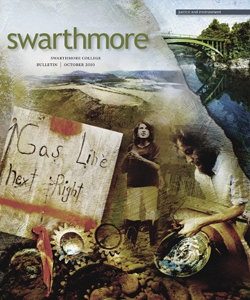 Project Pericles is an association of 26 American colleges and universities—launched by Eugene Lang ’38 in 1999 with 11 schools, including Swarthmore—each of which commits to prepare students to be citizens and civic leaders by incorporating social responsibility and participatory citizenship as an essential part of their educational goal. “I plan to carry on the work that many of us here do already, but with the added bonus of the Periclean network,” Berger says. His term as a Periclean leader ends in December 2011. This fall, Berger will adapt and update his Democratic Theory and Practice course, which combines traditional scholarship and community engagement, to give students a more meaningful understanding of democracy’s goals and challenges. “My students and I will work with some new community partners in Chester and Swarthmore, including the Chester Youth Courts and their mentor, attorney Greg Volz. I’m also putting together a community-wide conference to discuss Delaware County’s history and politics. It’s very exciting,” Berger said. The Faculty Leadership Program is supported by the Teagle Foundation and the Eugene M. Lang Foundation. Berger does more than teach politics. He’s been known to speak out on public issues—most recently on WHYY’s Radio Times, where he has become a regular guest. In July, Berger joined Joan Walsh, editor in chief of Salon.com, and Radio Times host Marty Moss-Coane to discuss topics including Arizona’s new immigration law and the idea of amending the Constitution to limit birthright citizenship. They also spoke of President Obama’s decline in popularity and his appearance on The View, the popular morning talk and variety show. Berger said: “The right-wing media is relentless in its opposition, but it’s not a conspiracy. There’s plenty of left-wing media and plenty of moderate media. But the right-wing media finds an audience, and they never miss a beat. Speaking of those who are disappointed that Obama is not achieving more in his first term, Berger advised waiting for a second term: “People need to be realistic about how politics are played out in this country and the different factions that are out there…. Anyone who thought Obama could do a public [health care] option right away was imagining things. That said, Americans have a deep-rooted aversion to being played for suckers. That doesn’t mean that they’re always right that they’re being played, but if they think it’s happening, they’ll mobilize, and that’s been happening in some of the opposition to big government.